If your dog suffers from greasy, itchy, scaly skin that has an unpleasant odor, it may suffer from seborrhea, a chronic condition that can also lead to a fungal or yeast infection of the skin. 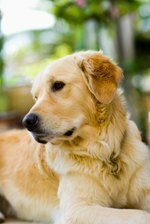 Bathe your dog with an antifungal human shampoo, such as Head & Shoulders, to treat this condition. This shampoo contains one percent pyrithione zinc, an antifungal, antiseborrheic and antibacterial ingredient that helps remove yeast and bacteria from the skin, as well as soothe and heal it. Brush your dog with a slicker brush to loosen any mats in its fur. After loosening the mats, brush them out of the fur with a bristle brush. When finished, give your dog a treat to reward it. Put a rubber mat into a bath tub to prevent your dog from slipping on the slick surface while you bathe it. Place your dog in a bathtub and attach a pet sprayer to your faucet, or use a hand-held shower attachment to wet your dog's fur. Use lukewarm water that is comfortable to the touch. Avoid wetting your dog's face. Lather your dog's coat with a quarter-size amount of Head & Shoulders shampoo. Rub the shampoo throughout your dog's coat, massaging it into the skin. Only lather the shampoo into your dog's coat up to its neck, avoiding the face. Allow the shampoo to sit on the dog's skin for 10 to 15 minutes. Wipe away any dirt or debris from your dog's face with a damp washcloth. Do not get shampoo into your dog's eyes, as it can cause severe irritation. Rinse your dog's coat and skin thoroughly with warm water using the sprayer or handheld shower head. Run your fingers throughout the coat while rinsing, to allow the water to fully remove all of the soap from the skin. Dry your dog with a towel to remove most of the water from the coat. Hold a hairdryer a few inches away from your dog's body and use it to finish drying the coat, if your dog will tolerate the noise. If your dog will not allow you to use the hairdryer, air dry the dog instead. Brush your dog's coat with a bristle brush to smooth the hair and prevent any tangles. Continue to bathe the dog with Head & Shoulders at least once a week, or up to two to three times per week in severe cases of sebhorrea. Give the dog a food reward after bathing to positively reinforce the experience.